Thanks to Tommy Holden for this tip. After typing COPYHIST and pressing Enter, simply go to another Windows application and paste in the information. COPYHIST is also a useful tool for troubleshooting. Do you use COPYHIST? What do you use it for? This is very useful, – thanks for posting it. I still wish you could double-click or triple click in the text window to highlight portions of the text like any other windows text based software. I guess I’ll have to put it in the wishlist again sometime. Granted F2 will provide the visual history of commands for the drawing open keeping in mind that Expert system variable varies what is returned for user prompts. Some users like to copy a history of what was entered. I would think in a case where a user had issues or wanted to share steps used to draw objects they may use Copyhist and provide that info to them. Copyhist is a quick way to get this copied to the paste buffer. 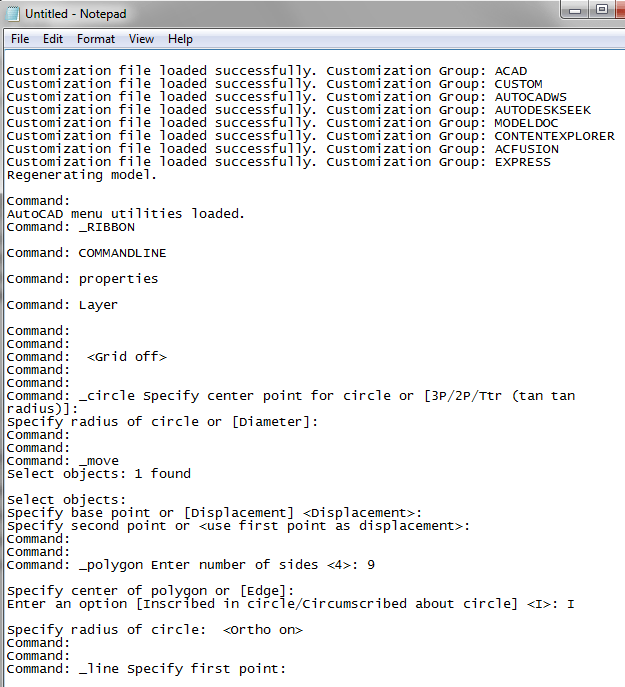 Another way to save imput and replies from AutoCAD is to set ‘Maintain a Log File’. You get a history of everything saved to a setting location set in ‘Options / files / Log File Location’ saved by the drawing name. System variable ‘LOGFILEPATH’ and commands LOGFILEMODE, LOGFILEON, and LOGFILEOFF aid setting these from the command line.